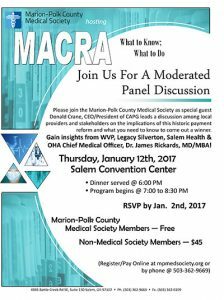 Join the Marion-Polk County Medical Society for a moderated panel discussion on the implications of MACRA and provider payment reform. Open to all who are interested or impacted, including administrators and managers, as well as providers. Marion-Polk County Medical Society members attend for free. Dinner provided; no-host bar.